The bitter rivalry between the Xiongnu tribe of Mongolia and the Han people of China is a defining feature of ancient Chinese history and no good history book is complete without a reference to at least one of their momentous clashes. Yet the story of Wang Zhaojun is one of the rare occasions when these two enemies found a way to get along. Zhaojun was born in Ping Village of Hubei province during the Han Dynasty (206 BC–220 AD) and, as she grew older, her almost ethereal beauty swiftly got her noticed. Heralded as one of China’s Four Great Beauties at the time, she was selected to become a lady-in-waiting for the Han court. However, it appeared that her exceptional beauty wasn’t enough to earn the Emperor’s affection. The Emperor rarely had time to meet his concubines in the flesh, and so depended upon portraits to pick which one he wanted to see. There were many attractive women in the palace and several of them bribed the imperial painter to make their portraits stand out, but Zhaojun did not want to be dishonest and so refused to bribe the painter, who in turn made her look far uglier in her portrait. Years went by and Zhaojun lived a hopelessly lonely life within the palace, overlooked by the Emperor and everyone else. In 33 BC a Xiongnu Chanyu or chieftain named Huhanye approached the Han imperials and expressed his desire to make peace by marrying a Han woman. Seeing an opportunity to escape her wretched life, Zhaojun volunteered to marry him and made the courageous choice to leave her ancestral home forever. When the Emperor finally took notice of her, he was overwhelmed by her incredible beauty but it was too late, she was promised to Huhanye. In one last attempt to make up for her awful life in the palace, the Emperor executed the painter who had wronged her. Talk about swift justice! 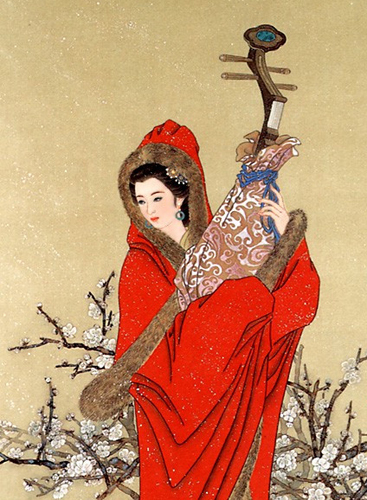 After her marriage, she was granted the title of Ning Huqueshi or Queen of the Xiongnu. She decided to adopt the local customs of her people and lived in a yurt, wore traditional blankets and furs, ate yak meat, and drank milk tea as a sign of respect for the Xiongnu. Her open-minded attitude gave new meaning to the phrase “when in Rome”! Unfortunately, in spite of her selfless efforts, her life would end in tragedy. After only 3 years of marriage, her husband tragically died and her application to return home was denied by the Emperor. According to tradition, she was forced to marry Huhanye’s son but, after 11 years, he too passed away. She once again appealed to the Emperor for permission to return home but was refused and, facing yet another marriage to Huhanye’s grandson, she opted instead to commit suicide. It is believed that she was largely responsible for the amicable relationship enjoyed between the Han and Xiongnu people at the time and, in commemoration of her achievements, the local people built a tomb in her honour. “Zhaojun Chu Sai” (昭君出塞) or “Zhaojun Goes Beyond the Frontier” is a phrase used to describe her departure from Han territory and her arrival in the Mongolian grasslands. It is regarded as a landmark event in Chinese history and is the subject of much poetry, theatre, literature, and music. 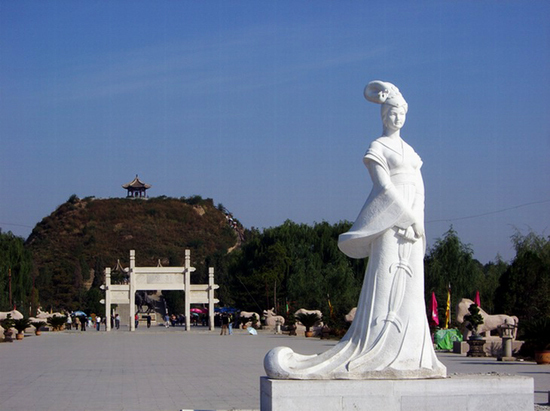 Nowadays her tomb rests just 9 kilometres (6 mi) from the city of Hohhot and is one of the city’s major attractions. It is sometimes referred to by its Mongolian name of Temür Urkhu or “Iron Wall”, as well as its nickname of “Green Tomb”. This nickname evolved from a local legend which states that when the wintery frost sets in and the plants are reduced to a withering yellow, the grass on Wang Zhaojun’s tomb miraculously remains green! Although her body does not actually rest beneath the 33-metre-high (108 ft.) burial mound, this honorary tomb is noted for its magnificent scenery and stunning statues. After all, how could you not be flattered to have a burial mound that’s taller than Buckingham Palace, even if you’re not necessarily under it! In front of the mound, there rests a 4-metre-high (13 ft.) bronze statue depicting Wang Zhaojun and Huhanye on horseback riding side by side and leaning in to talk with one another. Though the figures are obviously inanimate, the statue is so vivid that the intimacy between them is undoubtedly palpable. It serves as a testament to their marriage and what it meant for the Han and Xiongnu people. This is further evidenced by the many steles behind the statue, which were engraved by notable people from the Qing Dynasty (1644-1912) onwards and all praise Wang Zhaojun. Beyond the steles, a stone staircase leads to a platform where visitors can marvel at the panoramic view of the scenery surrounding the tomb and the silhouette of the misty Yin Mountains rising up in the distance. Recently an Exhibition Centre was built on the tomb site, which houses magnificent displays of paper cuttings, local artwork, and other charming artefacts, as well as live performances of traditional Mongolian ceremonies. Stele: An upright stone slab or pillar that bears an inscription and usually marks a burial site, like a tombstone.